Japan, unlike China, is not playing the retaliatory tariff game with the Trump administration. Instead, they are accelerating a market-opening agenda with more than three dozen countries (ex. the US). The new free trade push by Japan “threatens to cut into US market share and depress profits for US agriculture exporters by granting preferential access to…internal competitors,” a May report by the Agriculture Departments warned. At a recent public hearing, a coalition of US agriculture trade groups sounded a similar alarm. “Japan is our largest, most reliable and valuable market,” buying about half its imported wheat from Americans, said Vince Peterson, head of US Wheat Associates. “But today we face imminent collapse,” he said, as competitors will start taking American market share and sell their products at an effective tariff rate nearly 10% below those facing US producers. Peterson told government officials the US “has not sold one kernel of wheat” to China for several months because of the trade war. 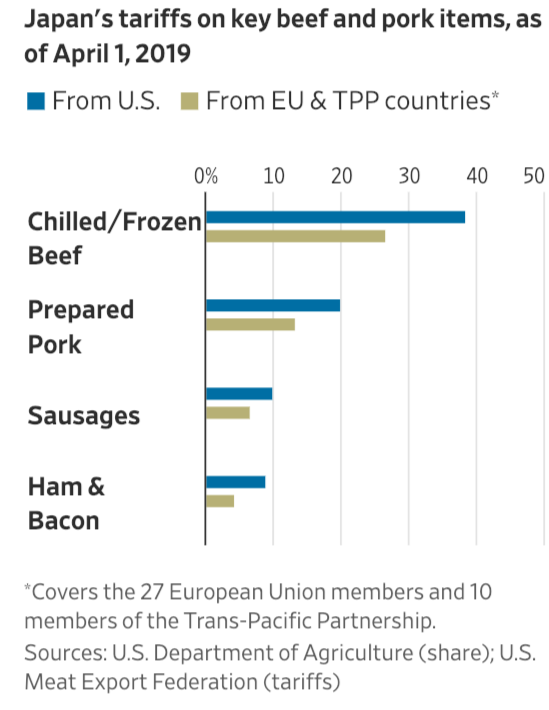 The US Meat Export Federation estimated that Japan’s new trade agreements (ex. the US) could severely damage American beef and pork exports, with expected losses of more than $1 billion within five years. The Trump administration has said they aim to correct that "emerging disparity by laying the groundwork to negotiate America’s own free-trade agreement with Japan," the Journal reported, adding that a new deal would reopen markets for American farmers. However, those negotiations with Tokyo are not scheduled to start until mid-January -- after both the Pacific and Europe trade deals take effect. US producers have already reported steep declines in business as a result of Trump pulling out of the TPP as Japan explores new markets. The Journal notes that US farmers are horrified about the loss of market share because Japan has been one of their largest export markets. American producers are the most significant food exporters to Japan, with at least 25% market share, ahead of the EU’s 13%. 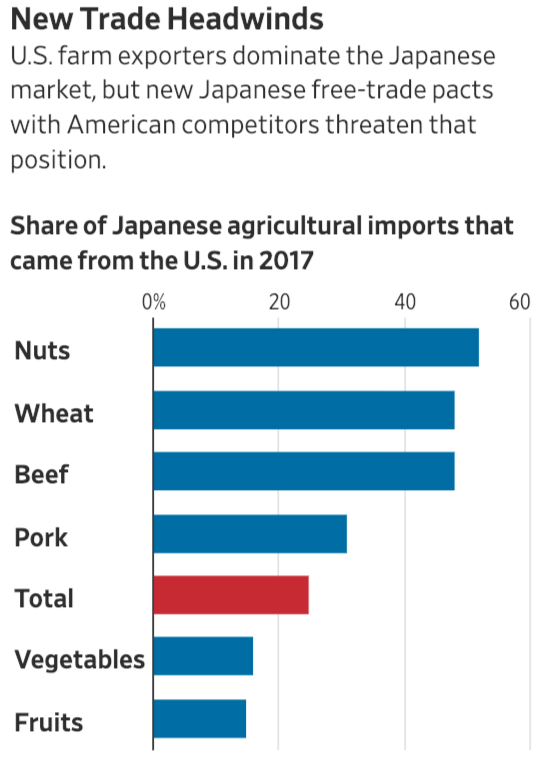 Japan imported $11.9 billion in American agricultural products in 2017, making it their fourth-largest foreign market, after China, Canada and Mexico. And while president Trump has argued that, overall, TPP would have harmed the American economy, for now due to lack of proper deterrence and countermeasures in place, it appears that like pulling out of TPP has forced even more pain upon America's struggling farmers who had export routes into Japan, and who may soon need another bailout from the administration.